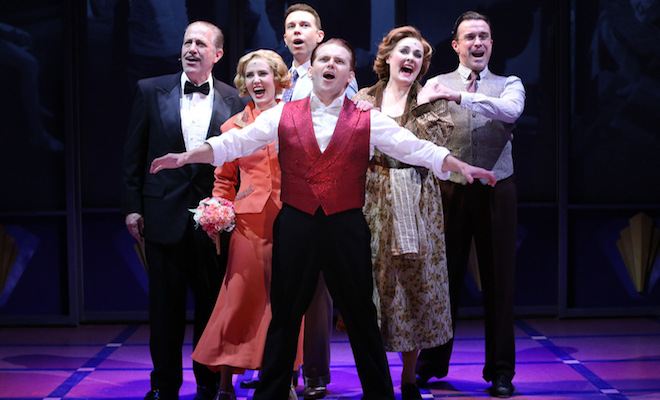 The company of Cagney, the hit musical about Hollywood’s tough guy in tap shoes, will celebrate one year of performances at The Westside Theatre on Tuesday, April 4. Cagney will conclude its celebrated run at The Westside Theatre on Sunday, May 28, 2017 after a total of 502 performances (including 21previews). Producer Riki Kane Larimerhas announced her plans to bring Cagney back to New York in a Broadway production. Not even five and half feet tall, James Cagney’s oversized talent catapulted him from scrappy Irish kid on the streets of New York to Hollywood legend on “the top of the world.” A Vaudeville hoofer turned actor, Cagney made a splash on Broadway before Hollywood called and made him one of the Silver Screen’s most iconic tough guys in legendary films including The Public Enemy, The G Men and White Heat. But it was his turn as song and dance man George M. Cohan in Yankee Doodle Dandy that earned him the Academy Award and forever cemented his place as one of America’s most beloved movie legends alongside the likes of Clark Gable, Charlie Chaplin, Marlon Brando, Jimmy Stewart and Fred Astaire. Cagney features a scenic design by James Morgan, costume design by Martha Bromelmeier, lighting design by Michael Gilliam, sound design by Janie Bullard, projection design by Mark Pirolo, music direction by Matthew Perri, music coordination by Larry Lelli, fight direction by Christian Kelly-Sordelet and Rick Sordelet, casting by Carol Hanzel, and general management by Brierpatch Productions. Cagney is produced by Riki Kane Larimer (On The Town, Gigi, Tappin’ Thru Life), in association with Jamie deRoy, Sharon Azrieli, Joe Cecala, Barbara Freitag, Joel B. Grossman, Joe Sirola, Mary Cossette, Emily Conner, Leonard Landau, 8350 Productions LLC, and In Fine Company. The successful Off-Broadway run of Cagney at Westside Theatre followed a critically acclaimed limited engagement at The York Theatre Company in 2015. LISTINGS INFORMATION: Cagney plays at The Westside Theatre, upstairs (407 West 43rd Street, between 9th & 10th Aves) through May 28. Performances are Tuesday at 7PM, Wednesday, Friday and Saturday at 8PM, with matinees Wednesday, Thursday and Saturday at 2PM, and Sunday at 3PM. Tickets are $89.00 (including a $1.50 facility fee.). Call Telecharge.com at 212-239-6200.